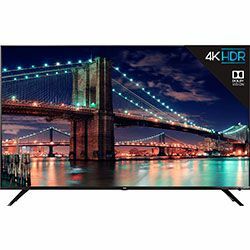 Samsung 55NU8000 vs TCL 55R617 test allowed me to compare the basic specs of two Smart LED TV models introduced in 2018. They both have a 55-inch display, large enough to enjoy premium UHD quality picture. Samsung is equipped with a quad-core processor working on Tizen 4.0 system. TCL 55R617 is armed with a dual-core processor based on the Roku operating system. TCL 55R617 produces the picture of 4K Ultra HD quality. It perfectly matches the UHD picture clarity with Dolby Vision impressive color, detail, and deep contrast. HDR10 technology contributes to the creation of the utmost lifelike images. 120Hz refresh rate powered by Clear Motion technology lets view fast-moving scenes with a minimum of blur. Direct LED backlight with contrast control Zones makes the blacks darker and the whites brighter to achieve natural picture. Samsung 55NU8000 TV isn’t inferior in picture quality and even exceeds the 55R617 at some points. Its 240Hz refresh rate with Motion Rate tech produces the images that look realistic in the fastest scenes. HDR Plus displays the images filled with rich true colors. Ultra Slim Array ensures a stunning contrast and powered by Dynamic Crystal Color lets enjoy millions of original vivid colors. TCL 55R617 Wi-Fi connectivity allows accessing Roku TV that features thousands of streaming channels. The TV has a handy remote control but consider that it must be adjusted to the TV during the initial setup. It will ensure the correct work of the device. Samsung 55NU8000 is a Smart TV that offers Bixby Voice. Along with a Universal Guide and one remote, Bixby Voice technology helps find streaming channels and live TV shows via the voice control. Also, Samsung offers more connectivity options. It has 4 HDMI inputs and 2 USB ports versus 3 HDMI and 1 USB in the 55R617 model. TCL 55R617, as well as Samsung 55NU8000, has a good and reliable assembling. TCL 55-inch flat screen is fitted in bold, brushed metal design. It has 4 legs that guarantee its fixedness. This model comes in black. Samsung also has elegant black color. Its 55-inch flat display is framed with a silver bezel, which makes it look very stylish. It has a single wide leg and stands firmly. All ports and connectors are hidden on the back panel. Budget TV of a high quality. Bluetooth audio streaming is not available. Supreme UHD micro dimming and 550 nits HDR sustained brightness allow achieving a stunning picture quality. The TV produces cracking sound after turning it on and off.